Activists Bach Hong Quyen (L) and Hoang Duc Binh (R) in an undated photo. Authorities in central Vietnam’s Nghe An province on Tuesday defended the arrest of an activist who had campaigned against Hanoi’s handling of a devastating toxic waste spill, saying he was responsible for a demonstration that took over a government office and created social disorder. Nghe An provincial police on Monday detained Hoang Duc Binh, 34, for “opposing officers on duty” and “abusing democratic freedoms to infringe on the interests of the state” under Articles 257 and 258 of Vietnam’s penal code. The activist will be held for 90 days, police said. On Tuesday, the Nghe An provincial government said Binh’s arrest was “in accordance with the law,” according to reports carried in state media, and claimed he had provoked a demonstration in early April that occupied the headquarters of the Loc Ha People’s Committee in neighboring Ha Tinh province. Additionally, the news website of Vietnam’s Supreme People’s Court issued a report detailing Binh’s activities in recent years, which it labeled “reactionary” and “politically colored,” including appeals to establish unofficial union groups. Most recently, Binh had been active in organizing protests over the government’s response to the April 2016 waste spill by Taiwan-owned Formosa Plastics Group’s steel plant, which killed an estimated 115 tons of fish and left fishermen jobless in four coastal provinces. Formosa has voluntarily paid U.S. $500 million to clean up and compensate coastal residents affected by the spill, but slow and uneven payout of the funds by the Vietnamese government has prompted protests that continue to be held more than a year later. Following Binh’s arrest on Monday, hundreds of people blocked off traffic in Nghe An’s Dien Chau district, near where plainclothes officers pulled over the car the activist was riding in, before proceeding to the front of the district government office to demand his release. Security personnel were later deployed in large numbers to shut down the gathering and “many protesters were beaten,” he added. Official media reported that after Binh’s arrest, several people “complied with the incitement” of activist priest Nguyen Dinh Thuc from the Catholic Church to demand his release, and that “four state propaganda officers” were held until the protest ended. In early May, Thuc and another priest, Dang Huu Nam, were denounced by the Vietnamese government for organizing protests against Formosa. Binh’s arrest drew condemnation Tuesday from local activists, as well as from international rights groups. Hoang Thanh, a Hanoi-based member of local environmental watchdog Green Trees, said Binh had helped the country by speaking out against Formosa and about how the company had affected people’s lives. “This is something we should be doing—it’s a very good idea in the present context,” he said. “It is impossible to catch all the people who are like Hoang Binh,” he said. Phil Roberston, New York-based Human Rights Watch’s deputy Asia director, told RFA that the government should be investigating Formosa instead of investigating the people who are demanding it take action against the company. “What we have seen is a greater level of oppression coming against those activists who are demanding that Formosa take responsibility,” he said. Reactions to Binh’s arrest came as scientists and area residents expressed concerns Tuesday over the government’s decision to allow Formosa to temporarily operate its steel mill in the Vung Ang Economic Zone, in Ha Tinh’s Ky Anh district, that was responsible for last year’s spill. In April, the environment ministry announced that Formosa had met conditions to start testing the steel mill after conducting a three-day inspection of the U.S. $11 billion-dollar plant and concluding that Formosa had addressed 52 out of 53 operating violations that had led to the spill. 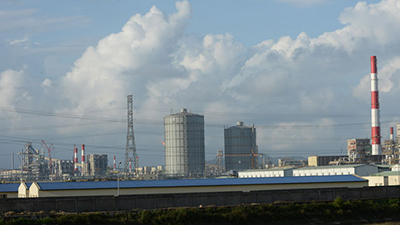 On May 10, the government granted approval to Formosa to begin a six-month test-run on its No. 1 blast furnace and auxiliary facilities, saying the company had effectively rectified the incident that polluted more than 200 kilometers (125 miles) of Vietnam’s coastline and was in full control of its operations. Le Huy Ba, former director of the Institute for Environment, Science, Technology and Management at the Institute of Industry in Ho Chi Minh City, told RFA Tuesday that he found the decision “worrying” because details of the inspection process had not been open to the public. “They said it’s good to operate now, but how good?” he asked. The Institute of Oceanography of Nha Trang’s Nguyen Ngoc Lam said the government cannot afford to undercut safety levels and allow Formosa to operate, even if only for six months. “For scientists, the reaction is very strong against this decision, but the problem is whether our reaction matters to the state or not,” he said. Residents of Ky Anh suggested that the government was not acting in the interest of the people by approving the test run and expressed frustration that their concerns are not being taken into consideration. “I almost have no reaction to their decision because I am just a normal person and everything is decided by the higher ups,” said one resident, who spoke on condition of anonymity. A second resident of Ky Anh, who also asked not to be named, told RFA that no one believes Formosa had addressed the problems that led to last year’s spill. “Formosa is a disaster for the Vietnamese people and I think the only solution is to shut the company’s operations down—nothing else will work,” the resident said. “The authorities lied and said it was safe to bathe in the sea and eat the fish [after the spill]—they treat us like little kids who know nothing,” he said. Gosh, this hurts! Everyone is on the right track, everyone is saying the right things, and everyone’s concerns are valid then why can’t these sadistic goons understand that? Where are their Ivy League graduates? Where are the commies’ ‘bright’ children that graduated from USA (notice they didn’t send their social misfit rotten kids to Russia or China)? Why aren’t they put the ‘good’ education to work for the country and the people? Either that they didn’t graduate at all and with fake diplomas! Stinking commies! They all talked and just a hollow shell without a brain or convictions. Worthless leeches, if the country is dried up one day, then what? VNCH and the good people of VN will rise again with the yellow and 3-red stripes flag leading the way! VNCH forever.